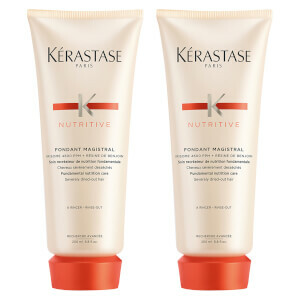 Nourish and nurture your hair with Kérastase Elixir Ultime Soin Conditioner, a creamy, oil-infused conditioner that works to soften and smoothen while improving manageability. Enriched with a five-oil blend, the shine-amplifying conditioner tackles frizz and dullness, visibly disciplining unruly locks to promote sleek, healthy-looking results. Provides nourishment for 48 hours* and effectively improves shine. Hair looks soft and shiny with a lightweight, silky touch. Suitable for fine to normal dull hair. *Instrumental test when used with the Bain. Aqua / Water, Cetearyl Alcohol, Amodimethicone, Glycerin, Cetyl Esters, Cetrimonium Chloride, Dipalmitoylethyl Hydroxyethylmonium Methosulfate, Trideceth-6, Phenoxyethanol, Benzyl Salicylate, Hexyl Cinnamal, Chlorhexidine Digluconate, BenzylAlcohol, Linalool, Limonene, Citric Acid, Citronellol, Zea Mays / Corn Germ Oil, Argania Spinosa, Kernel Oil, Camellia Oleifera Seed Oil, Caprylic/Capric Triglyceride, Geraniol, Caramel Ci 19140 / Yellow 5, Ci 17200 / Red 33, Phyllanthus Emblica Fruit Extract, Tocopherol, Parfum / Fragrance.